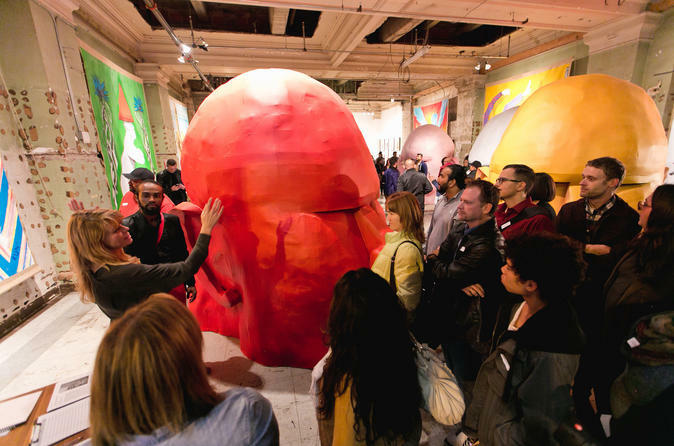 Uncover local treasures of the Downtown Los Angeles Arts & Culture scene on a 2 hour insider walking tour with a savvy expert art tour guide. Explore art studios, galleries, and museums, local murals and street art, meet and greets with local artists, and get a feel for the recommended specialty food spots. As you walk, you'll learn about this rapidly evolving city and get an insider's look at the art that is Downtown Los Angeles. Meet your savvy expert tour guide inside the Corporation Food Hall, home to a delicious array of culinary options before setting off on your 2 hour walking tour to explore the biggest L.A. Arts. As we walk, your guide will point out the best art and events the evening has to offer amid a vibrant sea of street art, art galleries, and artists studios brimming with creative excitement. We'll enter local galleries to discuss the art exhibitions and share opinions about the works. Provocative, eye opening, and inspiring work will be on view to inspire your imagination and ultimately expand what the art tour experience can truly be for you. Next, we’ll visit some dynamic and treasured murals that only the local artsy folks know about. We’ll briefly discuss their stories and importance and how they relate to the L.A. Art scene. Next, we’ll head to an artist studio and watch as the artist shares or demonstrates how she creates her work. From there, we’ll visit another studio/gallery in a charming courtyard just around the corner, embracing their work and exhibition. We’ll discuss the works with each other and you’ll be encouraged to explore the rest of the show before leaving to the final destination. While on the walk, you'll be introduced to some of the best local eateries and famous L.A. food trucks. We’ll finish off at the Hub, known locally as the Downtown Art Walk lounge, where we'll meet local vendors, enjoy progressive musical sounds, and meet the team who puts on the monthly show. This is where you’ll find out about other great shows and begin a new adventure for the rest of the Art Walk night!